Our first author interview is with Christie Rich, and WOW does she have an intriguing set of novels. The Elemental Enmity Series is definitely on the top of my "to buy in paperback" list. The artwork for this series is up there with the most beautiful I've ever seen. And the paranormal beings – the fae – well, I want to dive right into this story and see what they're all about. This is exactly the type of book that lures me, until it's in my hand and on my own shelf. 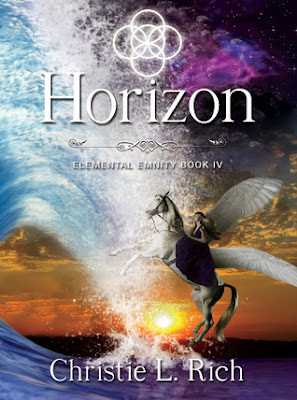 With her latest and final book in the series, Horizon – Elemental Enmity Book IV, available January 27 2013 - any moment now, I jumped at the chance to peek inside her creative mind. And I did discover a secret - there isn't one, but several swoon-worthy heroes in this series, but you'll see for yourself when you read it. So, Christie, what popped into your head the moment you thought of writing this series? What was your first thought on it? Was it a dream, a suggestion perhaps? What was your inspiration? "Lol, I never expected to have an idea for a complete series until one day a little pixie by the name of Fexlie flitted into my mind on my way home from work. I’d been reading voraciously after a stent of a ten year reading draught (not recommended!). Anyway, one of the series I couldn’t put down was Fever by Karen Marie Moning. The fae in her series were unlike anything I’d ever seen. They were dark and intriguing, but they were the bad guys. One question kept circulating my mind: what if the fae were misunderstood? I think this is how I connected to this story, and how Fexlie introduced me to the other characters. It’s been a total blast to write." Misunderstood antagonists – I love that! Can you describe your heroine? Is there any part of you in Rayla? If so, what do you two have in common? "You’re not the first to ask me if I instilled Rayla with a bit of myself. I think as writers we all give our characters a bit of ourselves. I don’t think it is intentional, but our characters tell their story through our experience. If I have anything in common with Rayla it is being too trusting and naïve. I want to think that everyone is essentially good. Like Rayla, I’ve gotten into trouble because of my trusting nature." If you're anything like me, you already have your actors picked out for the movie roles, may you be so lucky. Who would play Rayla. Who would play Heath? "I just did a guest post about this! I don’t have actors exactly, but these are the people I think best represent my characters. You can go to my pinterest account to see all of them." Rayla Tate - Emily DiDonato. Zach - A young Eduardo Verastegui. Ooo, pinning them – I think I'll do that too! Your covers are so beautifully colored. Did you design them? "Thank you! 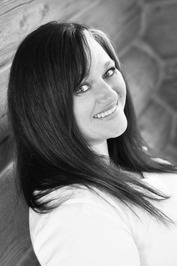 I have worked with the brilliant Amber McNemar, owner of eThink Graphic Solutions. I came up with the concept for each of the covers. I knew what I wanted and how I wanted each to look, and she captured my mental images completely. I adore her and her work. The color scheme has all been her vision of my concept. She’s great to work with." Can you tell us a bit about the fae? I'm so intrigued by these magical beings. "In Elemental Enmity the fae are here to protect the earth. They are vagabonds of a sort and needed a place to live when they got kicked out of their own universe because of rebellion. They are a complex people with political underpinnings that make Washington seem tame. They are more human than many fae I have read about, but that is how I see them." Wow! You've really put your own spin on these mysterious beings – the fae. Which makes for a unique read. Will there be a book 5 in the Elemental Enmity Series? "Horizon is the final book in Elemental Enmity, but I am not done with this world. There will be more stories told through the eyes of other characters, both prequels and sequels to this series. My next series will be Netherworld, which is set in a completely different world. So many books to write, so little time, lol." Before you go, can you share with us a favorite writing site, or tip? "Absolutely! I wouldn’t be where I am today if I hadn’t taken the advice (to a degree) of DeanWesley Smith. He is brilliant and a straight shooter. He has two sets of posts that are invaluable. The first is Killing the Sacred Cows of Publishing, and Think Like a Publisher. The publishing business is a nightmare to navigate when you don’t know what to expect, and his advice is the best I’ve seen, at least for me"
"Thanks so much for having me here today, and for the fun questions. I love this series and the characters have become my family. It’s fun to see the series come to a close, but it is also a little scary for me. If you are interested in the series, my first book, Five, is free for download on all major eRetailers. I hope you all will pick up a copy and enjoy a read on me." Heading to Amazon now . . . Evil has many faces—unfortunately, Rayla Tate has seen them all, or so she thinks. Since she learned she was an Elemental, she has been hunted for her power. But Rayla hasn’t met her greatest foe; she hasn’t seen true evil…yet. Rayla betrayed her bondmate to be with the man she loves. Now that she has Heath at her side, she is ready to face the fae council and move on with her life. Too bad Zach has other ideas. He’s not about to give Rayla up just because his sister got in the way. He will find Rayla and prove to her that he is the man she is meant to be with, even if he has to face the monsters of the dark realms to do it. Despite her growing feelings for Heath, with every passing day her body gives in to her bond with Zach. Rayla must leave the dark realms or risk losing control of her mind and ultimately her power. Once back in Lombarda, she discovers a secret about her origins that could shake the foundations of the world, both fae and human. There is more at stake than who she is bound to. The Order and the fae both want control of the same thing, and this time it is not her. Rayla must unite with unlikely allies to destroy the evil plaguing Faeresia. For if she refuses, she will succumb to a compulsion she never could have anticipated and plunge the world and those she loves into darkness or utter oblivion. "I love to be creative. It is more than a hobby. It is a need of mine. Whether writing, reading, painting, flower arranging or trying something new, I spend most of my time in the pursuit of freeing the creations inside me. I live in a small town in Northern Utah, I am so grateful for the rich life I have been blessed with." Thanks, Christie, for stopping by and giving us insight into your awesome series. It was lovely having you. Much luck in your writing career! Thanks for stopping by Indie-Licious, Christie. It was a pleasure having you. I just bought book 4, can't wait to read it. It all started reviewing book 1- five and I loved it so much, I had to read the whole series!! Wow! Thank you so much, and Andrea! I'm so happy you've enjoyed Elemental Enmity! Thanks for your support and for telling me! Happy Reading~Horizon is quite a ride! I just shared this one on my FB Page!! One of my favorite authors and series!! GR8 Interview! !